This is above all a mountain region. Wherever your gaze turns inland from any point on the coast, you will encounter an endless theory of rocky peaks soaring skywards: from north to south, the massifs of the Laga, Gran Sasso and Majella ranges. A fantastic high-altitude universe that is the rocky backbone of this region, constituting the most formidable Apennine mountain complex (with obviously alpine features), in the heart of Italy and the Mediterranean. There are sharp peaks that skim 3,000 metes in height, immense intra mountain plains, narrow gorges eroded by impetuous torrents and wide valleys cut by ancient glaciers, lakes, cascades, wild ravines and rolling pastures, endless woods, pine grove and high-altitude steppe. All basking in the scent of sea air, because the Adriatic is only a few kilometers away. 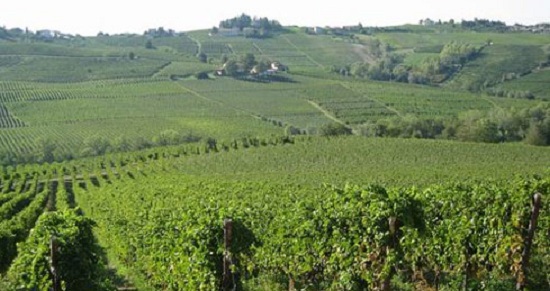 In between the gentle hillsides with their olive groves and vineyards, plunged in tradition and atmosphere. The great plateau are absolutely the most alluring aspect of the Abruzzo mountains: who would think of seeing Tibet just an hour from Rome. These huge intra mountain plains, in some cases only a few kilometres wide, in other instances roll on for many kilometers, were formed during the geological eras by the action of glaciers and by the very karstic nature of these mountains. 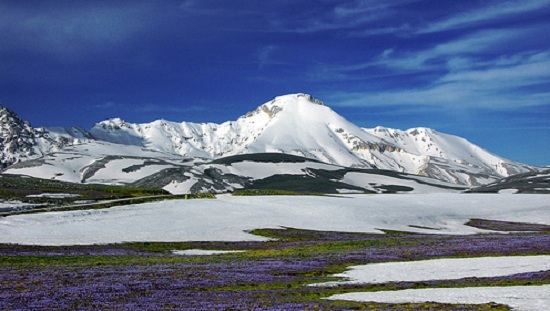 A first visit to one of the great highlands of Abruzzo, especially if we refer to Campo Imperatore is a fascinating experience and may well remain etched forever in your mind. Apart from Campo Imperatore, we could suggest Piano di Cascina, north of L’Aquila and near the Latium border; the Voltigno, looking over the province of Pescara from the crest of Gran Sasso; the delle Rocche plateaux, wedged between the Sirente and Velino peaks, with the neighboring Piani di Pezza and Prati del Sirente; Passo San Leonardo, the Majella plateau; and to close, in the southern mountain area, another enormous complex, the articulated great plateaux or Altipiani Maggiori of Abruzzo: Piano delle Cinquemiglia, Piano d’Aremogna (above Roccaraso), the plains among Roccaraso, Rivisondoli, Pescocostanzo, the Sant’Antonio wood and the Forchetta pass. Then there are the plain-type environments amidst the peaks, which geologists and geographers call “high-altitude summit plains”, which have in store some equally thrilling emotions, with their extreme moonscape atmosphere: we refer to la Valle della Femmina Morta (dead women valley) on Majella; Serra di Chiarano, connecting Abruzzo, Lazio e Molise National Park to Majella. Places that may be difficult to reach but which offer a unique experience in nature. Needless to say, mountaineering is the main sport in the region. Anyone who conquers any peak in Abruzzo and takes the time to take in the horizon, will perceive the truth of the words uttered by the famous Orientalist Giuseppe Tucci, who was convinced that no other landscape in the world resembled Tibet as much as the mountains of Abruzzo. 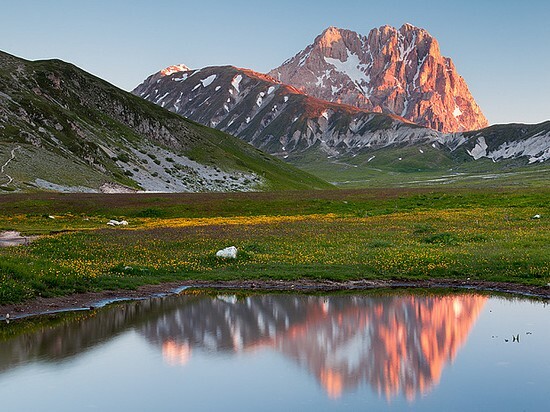 Both in summer and winter, fans of even the most demanding mountain sports, will find Abruzzo’s massif offer not only a worthy challenge, but also marvellous surroundings. 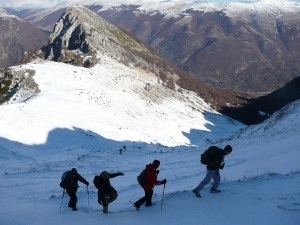 Classic mountaineering, free climbing, ski touring, are all catered for in Abruzzo, whose scenarios require different levels of expertise. 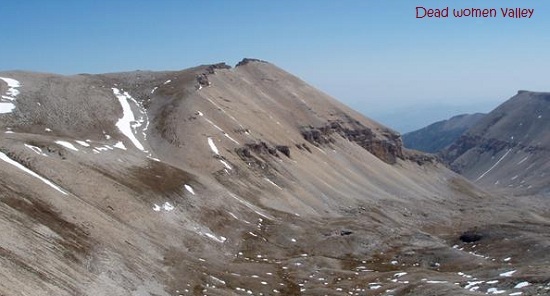 The first documented “sport ascent” was actually in Abruzzo, on Gran Sasso in 1573. 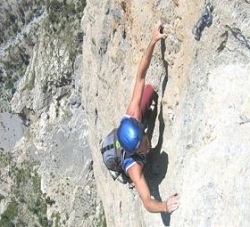 Two accomplished rock-climbing schools (one at Assergi, on Gran Sasso, and one at Abbateggio, on Majella) flank the mountain guides, and teach both classic and modern freeclimbing techniques, whereas the mid-mountain guides are linked to four nature trekking schools (L’Aquila, Spoltore,Villetta Barrea and Caramanico). There are also many very active sections of the CAI (Italian Alpine Club), a historical association that has also operated in Abruzzo for over a century to support the thousands of enthusiasts exploring the mountains, teaching them to know, respect and love them. This overview of organized practice and training dedicated to mountain sports is completed by several hiking associations active on regional territory, who organize excursions, climbs, high-altitude hikes. 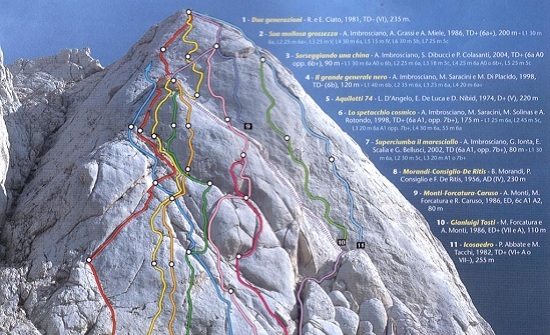 There are countless climbing scenarios of all types and levels of difficulty: the tormented, vertical orography of the Gran Sasso massif has some typically alpine environments and settings, with rock faces, pinnacles, aiguilles and even the Calderone glacier, Europe’s southernmost. 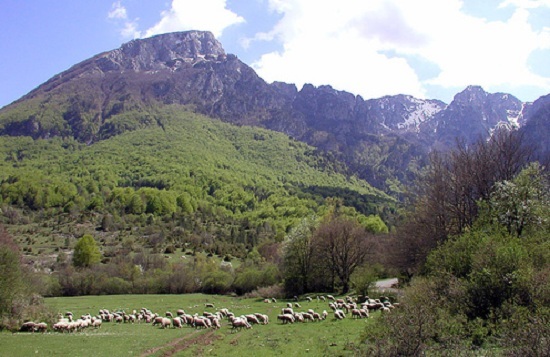 Conversely the other mountains complexes, especially Majella, are rounded by erosion phenomena and are more suitable for trekking, whereas the rock faces of several ravines are amazing theatres for stimulating quality climbs. 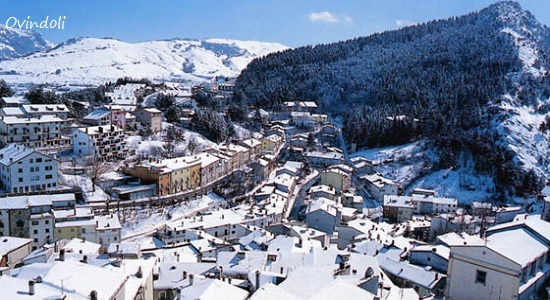 Especially in winter, aficionados will certainly be guaranteed thrilling moments on the Abruzzo mountains. Peaks, crests and frozen waterfalls are the fascinating itineraries for experts with an ice axe and crampons, gullies that shoot down more than 1,000 metres from the taller pinnacles are amazing challenges for ski touring, on a par with Scandinavia or the Alps, and Abruzzo’s top-notch mountain guides are available to accompany, suggest and teach. 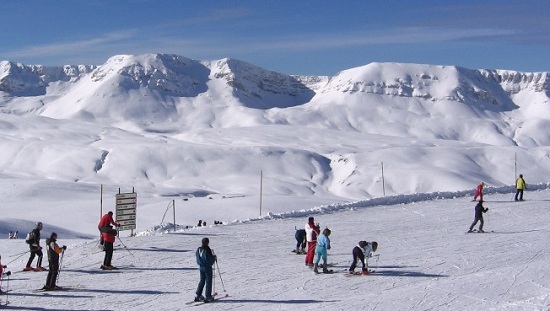 Downhill skiing resorts in Abruzzo : San Giacomo - Monte Piselli - Prati di Tivo - Prato Selva - Campo Imperatore - Monte Cristo - Campo Felice - Ovindoli - La Magnola - Marsia - Campo Rotondo - Ovindoli - Pescasseroli - Scanno - Roccaraso - Rivisondoli - Pescocostanzo - Pizzoferrato and Gamberale - Passolanciano - La Majelletta - Campo di Giove - Pacentro - Passo San Leonardo.